Recently made the jump back to AMD from a 4790k & Maximus VII Hero MB to the setup below and couldn't be happier.. Waiting on the next Gen. 3700X when it releases.. I know it's a decent OC for the chip I just feel that compared to stock speed this isn't that great of a gain. Is it worth it to overclock a 1800x to 4.0-4.1 GHz? I remember seeing Techpowerup's review some games even had lower fps on a 4.0ghz all core overclock because the stock xfr can reach 4.1ghz by itself. Any opinions? If the game you are playing dosen't make use of more than a couple cores you can be better off using XFR . The downside is it can be pretty inconsistent if other things are going on in the background etc. I've been running mine at 4175 mhz all core - XFR can't touch that. What games do you play, what board do you have? what cooling? Thanks for the reply. I play mainly rainbow six siegue and the battlefield series. Not sure about rainbow six, but battlefield will love more cores at 4.1 ghz than xfr provides. I've averaged 180 FPS for entire 64 player maps on BF1. Sounds like you should be good to push harder given your board and cooling ( assume your psu is up to it too?). I've been running 1.52 volts to mine for quite a while now - but the LLC function on my board isn't as heavy handed as some are. 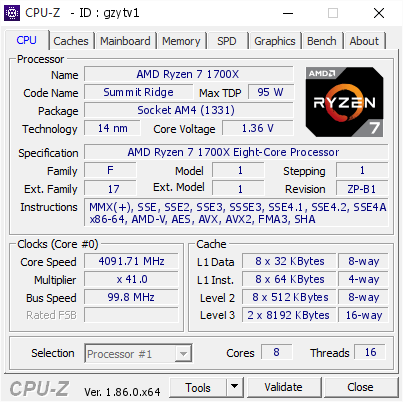 Release day batch Ryzen 1800x - it needs that much to be stable at 4175 mhz - later batches or 2xxx's don't seem to need nearly that much. No noticable degradation so far, will still do 4ghz prime on all cores at default voltage. I didn't see this wallpaper posted in here yet. Enjoy! Last edited by speed_demon; 01-15-2019 at 03:21 PM.